My granddaughter’s love tea parties and so do I! 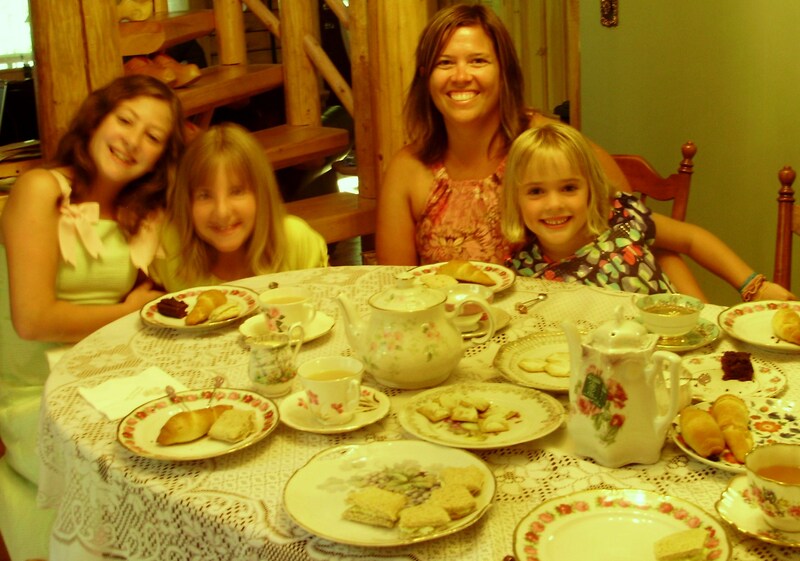 So this afternoon we had a tea party and invited a neighbor and her daughter. We all got dressed up, made up and hair fixed! It was a lovely time! We had tiny egg salad sandwiches, two kinds of wheat thins with cheese spread, cresent rolls, small brownies, and tea. There were two kinds of tea to choose from: Apple Cinnamon and Huckleberry. We visited and then ended with reading a story, You are Special by Max Lucado. We love tea parties! This entry was posted in Friends, Grandchildren, Tea Party. Bookmark the permalink. Oh, it looks delightful. I love that you used your best china and of course the special teapot. I bet the ladies loved it. I liked your menu too. We plan to have a tea party in the near future here. I like egg salad, and I think they will too. We have 4 granddaughters but the boys are expressing desire to come too. So we might have them dress fancy too and come. We will see. From way back when most of them were 3-4 we have had tea parties, pretend, nothing extreme. So they have loved them. Thanks for inspiring me to get going on the date before the kids get back to school. If not we will do it on a Sat. It has been such a busy summer. Must get some blogging done. You are an inspiration to all the grandmas in the world. Thanks for your good reply. I love tea parties. My granddaughters and friends feel so special. Using my Bone China helps in making them feel special. They love to get all cleaned up, dressed up and made up. It’s a great time for them to learn etiquette and proper manners. We’ve never invited the boys, they’ve always done something special with the men. But, they need to learn proper etiquette too! Have a great time at your tea party. I wish I could be there too!